Learn Spanish through crossword puzzles!Easy Spanish Crossword Puzzles offers you an entertaining but effective way of expanding your knowledge of the Spanish language and culture. The crucigramas in this book cover a wide variety of topics that will challenge and help you develop your Spanish-language skills. 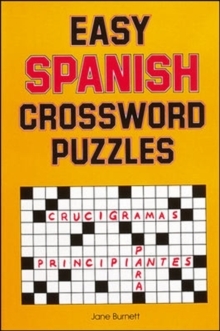 Easy Spanish Crossword Puzzles features two levels of difficulty. In the first half of the book, you will find simple English-to-Spanish puzzles that explore topics of grammar and culture normally addressed at the beginning of Spanish studies. In the second half, the puzzles are all in Spanish and thus are somewhat more difficult.